Learn about the basics of payroll processing and your obligations as an employer. Pay your employees: Calculate gross pay and taxes withheld each pay period. Pay taxes: Pay taxes withheld from employees' paychecks as well as the tax liabilities you incur as an employer to the appropriate government agencies. File tax forms: Forms must be processed every quarter. Even if you've paid everything you owe, you still have to file tax forms that report your liabilities. We break down the payroll process for you. And answer some frequently asked questions from new employers. Hourly: You'll need to set the hourly rate for each employee. Most employers set an hourly rate by assessing the state and federal minimum wage limits, the average market rate for the job/role, and experience and education of an employee. Salary: Salary wages are set amounts. The employee receives the same amount each paycheck. As a rule of thumb, determine the annual salary first, then divide by the number of pay periods in the year to determine the salary amount for each paycheck. Salaried employee hours typically fluctuate. So there's no real way to determine their hours unless you're keeping track of their time through a time management system. If for any reason you need to determine their hourly rate, divide their annual salary by 2,080 (this amount is the average hours a person works in a year; 40 hours a week x 52 weeks = 2,080 hours). Commission: Commission employees are paid by performance. Most often, these employees receive a percentage of their sales. Or they're paid by number of products or services sold. Federal and state law require the employee to get paid at least the minimum wage. Tips: The minimum wage for tipped employees is much less than the minimum wage for hourly employees. Tips can either be collected through the paycheck if the tip is paid by a credit card. Or can be collected directly from the employee if the tip is cash. Other compensations There are a variety of other ways to pay your employees. Be sure to work with your state, business, and/or accountant to determine what types of compensation are needed. Most payroll taxes, such as income tax, apply to all earnings. However, some taxes have a wage cap. (The maximum annual earnings per employee that is subject to that tax. These caps can be adjusted by the governing agency.) See the chart below for the most common payroll taxes. Paid by both employers and employees. As an employer, you withhold the employee's part of the taxes. And also pay the federally regulated amount for the company portion. The tax rate (amount withheld) for social security is 6.2%. And applies to both employees and employers. This is a tax with a wage cap. This means the tax is calculated only up to a maximum dollar amount of wages per employee each year. For 2019, the wage cap for social security is $132,900. The amount of federal income tax (FIT) withheld from employees' paychecks depends on their marital status, the number of withholding allowances (exemptions) they claim on Form W-4, pay frequency and their projected annual income. In addition, all but nine states have a personal income tax (PIT) (exceptions are Alaska, Florida, Nevada, New Hampshire, South Dakota, Tennessee, Texas, Washington, and Wyoming). It can be a flat tax rate (as in Illinois), regardless of projected income. Or a graduated tax rate based on annual income, such as FIT. In some states, employees can also pay local tax (to cities, counties, or school districts) from their paycheck. Filing status: The marital status that dictates which tax table is used to calculate income tax withholding. For federal income taxes, four filing status options are available: single, married filing jointly, head of household, and married filing separately. Withholding allowances: Also called exemptions. Withholding allowances reduce taxable income by a designated amount per allowance. The IRS updates allowance amounts periodically. Factors such as number of dependents influence how many allowances an employee can claim. Additional amount to be withheld: Amount that is added to the income tax calculated for each paycheck. It is in addition to the amount of income tax withholding that is based on the employee's filing status and withholding allowances. The W-4 form includes several worksheets to estimate the most accurate projection of tax liability. Some states have similar forms for state tax liability. The Federal Unemployment Tax Act (FUTA), along with the state unemployment systems, provides for payments of unemployment compensation to workers who have lost their jobs. For 2019, the effective FUTA tax rate is 6.0%. However, most employers qualify for the 5.4% state unemployment tax credit, which lowers the effective rate to 0.6%. The tax applies to the first $7,000 employers pay to each employee as wages during the year. However, if any of your employees are exempt from State Unemployment Insurance (for example, they are Directors or Officers), your FUTA tax may be higher. Also, if your state has borrowed funds from the federal government to cover shortfalls in its unemployment insurance program, all employers in your state may be subject to additional tax liability at the end of the year to repay those loans. The money that all states maintain as a reserve for unemployment funded through an unemployment insurance tax. In most cases, SUI is paid only by the employer. Employees in some states, such as New Jersey and Pennsylvania, also contribute to SUI through their paychecks. Most states have established a starting SUI rate for new employers. After a designated period of time, employers are assigned an experience rate, which can be higher or lower than the new employer rate, depending on the employer's reserve account balance. You receive a notice from the state if your rate changes. State disability insurance (SDI) or workers compensation are administered by some states as a tax collected through payroll. Many states also have a tax paid jointly with SUI that is used to fund job training programs. Some types of employees are exempt from one or more payroll taxes. For example, a minor working for a parent who is a sole proprietor does not have to pay social security, Medicare, or FUTA. In addition, certain portions of regular employees' wages might be exempt from one or more payroll taxes. For example, tax-sheltered or pretax insurance plans save both the employer and the employee money by exempting premium amounts from all federal taxes and some state taxes. Some fringe benefits, such as S-Corporation owners' health insurance, are also taxed differently from regular wages. If your company is a not-for-profit 501(c) (3) corporation, you do not pay any FUTA taxes regardless of who your employees are. Intuit Online Payroll automatically handles the special taxability of certain wage types. If you have employees who are eligible for special tax exemptions, you can indicate this when you are setting up the employees in your account. Your accountant can help you determine whether you have employees in this category. However, most employees pay all payroll taxes. If you have the QuickBooks Desktop Payroll subscription and have employees who are eligible for special tax exemptions, you can configure this when you are setting up the employees in your QuickBooks Desktop. Your accountant can help you determine whether you have employees in this category. However, most employees pay all payroll taxes. As an employer, you remit taxes to the IRS and to your state agencies either by paying electronically or by using a form provided by the tax agency. Before examining the timing of tax deposit due dates or deposit frequency, let's look at some common payroll terms. Rule that makes employers responsible for payroll taxes on the date they pay employees, regardless of when they did the work associated with that paycheck. If the employer pays employees only on Fridays, you only report a tax liability on Fridays, even if employees earn wages every day of the week. A common point of confusion is when work is performed in one tax period, but employees are paid in a different tax period. The IRS only tracks when employees are paid, not the span of time when the money is earned. Example: Tom's Market pays employees every two weeks. Employees receive a paycheck on January 6, 2019, which covers work performed during the pay period December 19 and December 26 2018. Question: In which month does the tax liability for this payroll fall? Answer: Tom's payroll is considered part of his January 2019 tax liability, even though the pay period fell completely in December 2018..
A reference period used by the IRS to determine your federal tax payment due dates. The IRS evaluates your tax liability during this 12-month period and determines whether you are a monthly or a semiweekly depositor for the coming year. Most new employers are monthly depositors. For 2019, the the lookback period is July 1, 2017 - June 30, 2018. The span of time during which tax liabilities accumulate for each deposit due date. The following deposit schedules apply to all federal taxes other than FUTA. Monthly depositors: You are a federal monthly depositor in 2019 if your company's federal tax liability during the lookback period (7/1/17 through 6/30/18) was $50,000 or less. This is why all new employers are monthly depositors. Monthly depositors pay taxes for a given month by the 15th of the next month. For example, June taxes are due by July 15th. However, if the 15th falls on a weekend or federal holiday, the taxes are due the next banking day. Taxes accrued during the Wednesday through Friday period are due on the following Wednesday. And taxes accrued during the Saturday through Tuesday period are due on the following Friday. In some cases, when a federal holiday (such as July 4 or Christmas) occurs during the week, semiweekly depositors have an extra day to make their tax payment. Next-day deposit rule: If you accrue $100,000, or more, in federal tax liability at any point during a deposit period, you must remit taxes on the next banking day. This can result from a single payroll. Or it can result from multiple payrolls within a single deposit period (monthly or semiweekly). For example, if you are a monthly depositor and pay a one-time bonus to employees that results in more than $100,000 in liability on a single day, you must pay the amount due immediately. You also become a semiweekly depositor until your lookback liability falls below the $50,000 threshold, again. Quarterly exception: If you owe less than $2,500 in federal taxes for a quarter, you can choose to pay when you file your taxes at the end of the quarter (instead of making deposits during the quarter). If you're not sure how much your business will grow, you should make more frequent deposits, because the IRS assesses penalties if you owe more than $2,500 at the end of a quarter and have not made tax deposits. Annual exception: If the IRS has notified you in writing that you are a 944 filer, and your total annual federal tax liability is less than $2500, you can make your federal tax deposits annually. The 944 filing status is for very small employers who typically pay $4000 or less in annual wages. If you accrue less than $500 of FUTA liability in a quarter, you do not need to make a deposit until the following quarter. If your liability remains under $500 for the entire year, you can make a single payment at the end of the year (on or before January 31). SUI is paid once per quarter to your state. Intuit Online Payroll Enhanced also prompts you when you have a SUI payment due. Like the IRS, states have established deposit schedules for paying income tax you've withheld from your employees' paychecks. When you register with the state revenue agency, they notify you of your state deposit schedule. Like FUTA, SUI taxes are remitted once a quarter, regardless of the employer's size. In addition, other taxes administered by a state's unemployment commission, such as Arizona's Job Training Tax or New York's Reemployment tax, tend to be paid jointly with the SUI tax on a quarterly schedule. In states such as Florida and Nevada, where there are no state taxes withheld from employees' wages, SUI is the only payroll tax employers pay, so all employers pay taxes quarterly. Form 941: Most employers file this tax form every quarter with the IRS. It compares federal payroll taxes owed with taxes paid during the quarter to determine whether your payments were timely. And whether you have a balance due. Form 944: Employers who have received written notice from the IRS can file Form 944 annually instead of Form 941 each quarter. 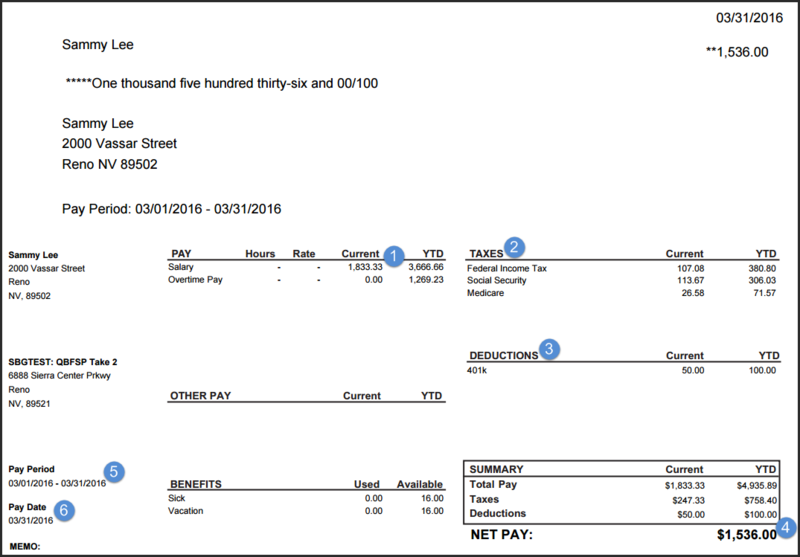 Like Form 941, it reports wages and calculates federal payroll tax liability. Most 944 filers also pay taxes once a year. Form 940: All employers who pay FUTA file this tax form at year end with the IRS. Like Form 941, it compares FUTA tax liability with FUTA tax payments to determine whether your deposits were timely. And whether you have a balance due. Form W-2: All employers provide Form W-2 to each employee at year end as an earnings record for income tax filing purposes. You are also responsible for filing Form W-2 with the Social Security Administration. Wage reports: Reports wages paid to each employee for a given quarter. They are sometimes combined with a quarterly contribution report that calculates SUI tax owed. And is typically accompanied by the SUI payment at quarter end. Most states require both a wage report and a contribution report each quarter, either as separate forms or as a combined form. Many states also require a quarterly reconciliation for state income tax. Annual reconciliations: Some states require filing an annual reconciliation for income tax at the end of the year. This might or might not be accompanied by copies of employees' W-2s .Cities, counties, and school districts that assess taxes might also require quarterly or annual forms. And might require copies of W-2 forms. Check with each agency to which you pay tax. Gross pay is the amount owed to the employee without any deductions or taxes taken out. Employee-owed taxes are taken out of gross pay. These typically include federal income tax, Medicare, social security, and state income tax. As an employer, it's your responsibility to hold and pay these taxes on behalf of your employees. Employee-owed taxes come at no additional cost to you as an employer, as these amounts were already included in the expense for gross pay. However, you are also liable for employer-owed taxes, which typically include federal and state unemployment. And your share of Medicare and social security. These are not included on a pay stub as these do not pertain to employees and they don't need to know about these expenses. You can find these amounts in your Tax Liability or Total Cost reports provided by Intuit payroll services. 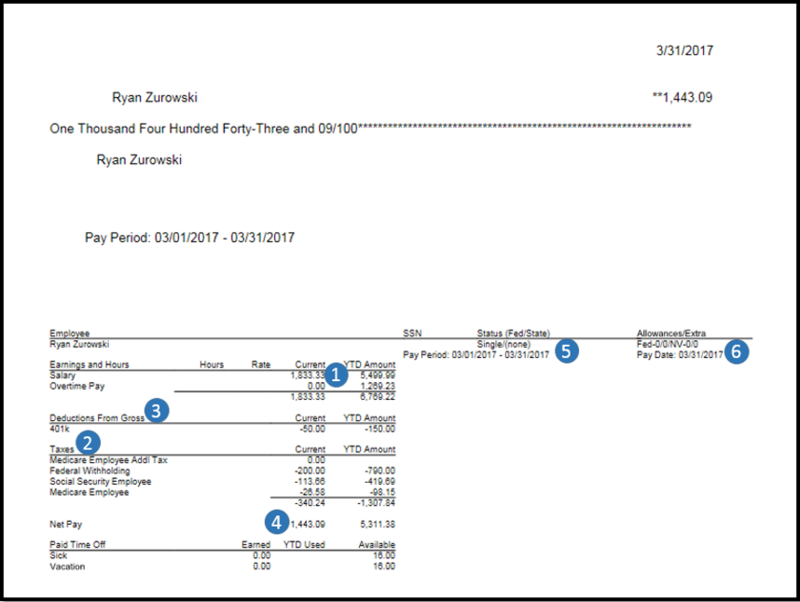 If you have the QuickBooks Desktop Payroll subscription, you can find these amounts under Pay Liabilities or Payroll Summary report in QuickBooks. Typical deductions include health, vision, and dental insurance. These are mostly voluntary. But the employee could also have involuntary deductions, such as garnishments like child support. This is the employee's take home pay. At this point, all taxes and deductions have been taken out. The employee can cash their check to receive this amount. Or if they're set up for direct deposit, this is the amount that will hit their bank account. This is the period of time the work was performed. Pay periods are typically weekly, every other week, or monthly. The pay date is the date the employee has their paycheck in their hands. Or if they're set up for direct deposit, this is the date the funds will hit their account. The pay date is also the date that determines when tax amounts are due. Refer to the Constructive Receipt section above for more details about the importance of this date. You must register with both the federal government and your state when you hire your first employee. When you register, you are assigned a federal Employer Identification Number (EIN) and usually, a state EIN. In some states, you register with both the state revenue agency. And the unemployment insurance agency. The fastest way to register and receive a federal EIN is online. How do I know how much to withhold? Have employees fill out a Form W-4 to declare their status and allowances. As you set up each employee in Intuit payroll, enter this information. Intuit payroll services can now calculate withholding taxes. You can also withhold voluntary deductions, such as health insurance or retirement plans. The amount of control the employer has over the worker determines whether or not the worker is an employee or an independent contractor. If the employer controls what must be done and how the work gets done, and supplies the tools to complete the work, then the worker is an employee. If the worker controls how the work is to be done, the worker is self-employed. Self-employed workers usually provide their own tools and have independent businesses serving multiple clients. For more information regarding whether a worker is an employee or a contractor, see IRS Publication 15, Employer's Tax Guide. As the owner of a business, am I considered to be an employee? The owner, sole proprietor, or partner in a small business does not earn wages. And is not considered an employee (some LLC members and S-Corporation owners are also not employees). To confirm a worker's employment status, talk to your accountant or see IRS Publication 15, Employer's Tax Guide. What is workers' compensation insurance and do I need it? Workers' compensation is a state-administered program to pay for injuries that occur in the course of employment. Workers' compensation insurance is required for nearly all employers in all states. If you are a small business employer, consult your insurance broker. It's very important that you have adequate workers' compensation insurance. Otherwise, if your employee is injured on the job, you can be personally liable. Not only for the cost of medical treatment, but also for disability payments during the period in which the employee is unable to work.